Like most things on Linux, the sudo command is very configurable. You can have sudo run specific commands without asking for a password, restrict specific users to only approved commands, log commands run with sudo, and more. The sudo command’s behavior is controlled by the /etc/sudoers file on your system. This command must be edited with the visudo command, which performs syntax-checking to ensure you don’t accidentally break the file. The user account you create while installing Ubuntu is marked as an Administrator account, which means it can use sudo. Any additional user accounts you create after installation can be either Administrator or Standard user accounts – Standard user accounts don’t have sudo permissions. You can control user account types graphically from Ubuntu’s User Accounts tool. To open it, click your user name on the panel and select User Accounts or search for User Accounts in the dash. 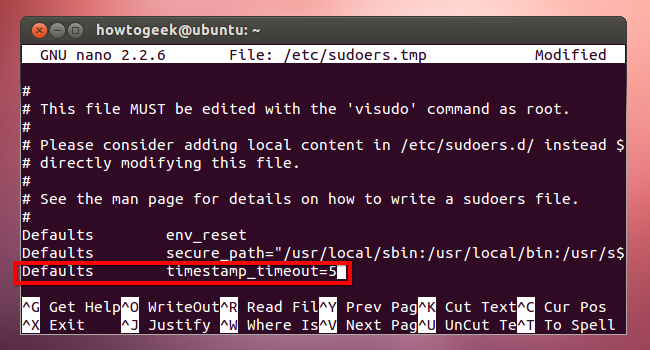 If you’d rather be prompted each time you use sudo – for example, if other people regularly have access to your computer — you can disable the password-remembering behavior entirely. In spite of its name, this command defaults to the new-user-friendly nano editor instead of the traditional vi editor on Ubuntu. Press Ctrl+O to save the file, and then press Ctrl+X to close Nano. 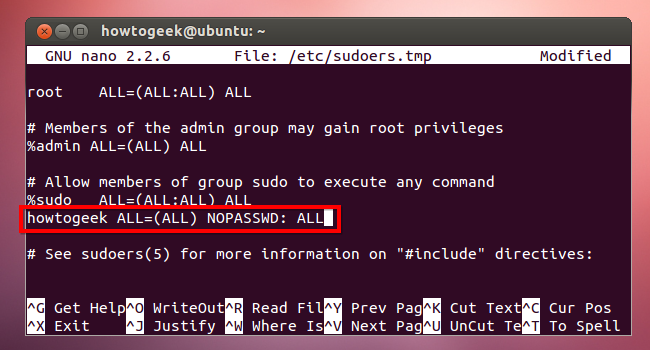 Sudo will now always prompt you for a password. 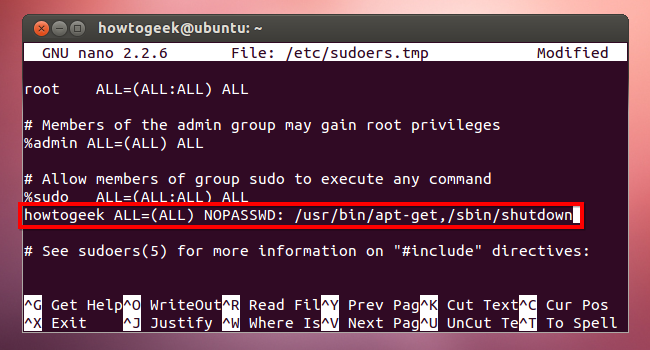 You can also specify specific commands that will never require a password when run with sudo. Instead of using “ALL” after NOPASSWD above, specify the location of the commands. For example, the following line will allow your user account to run the apt-get and shutdown commands without a password. 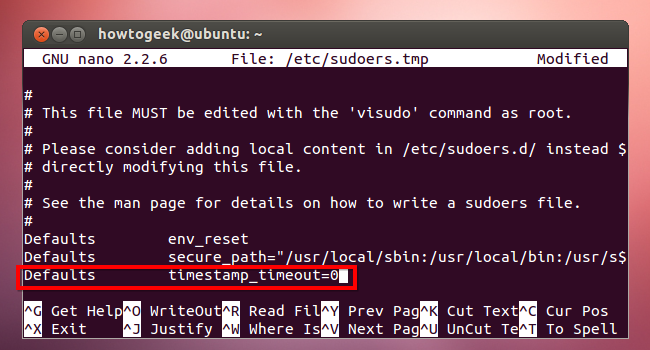 This can be particularly useful when running specific commands with sudo in a script. While you can blacklist specific commands and prevent users from running them with sudo, this isn’t very effective. 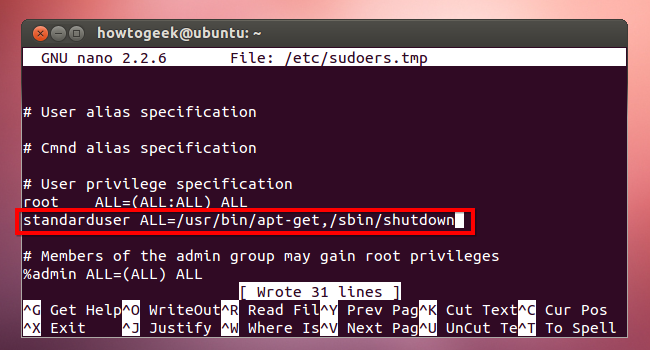 For example, you could specify that a user account not be able to run the shutdown command with sudo. But that user account could run the cp command with sudo, create a copy of the shutdown command, and shut down the system using the copy. You can log all sudo access by adding the following line. /var/log/sudo is just an example; you can use any log file location you like. Bear in mind that, if a user has unrestricted sudo access, that user has the ability to delete or modify the contents of this file. A user could also access a root prompt with sudo and run commands that wouldn’t be logged. The logging feature is most useful when coupled with user accounts that have restricted access to a subset of system commands.